Our National Organic Programme certification validates our operation fully compliant with the US National Organic Program (NOP). 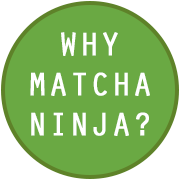 Matcha Ninja also produces Transaction Certificates (TC) for each batch of matcha which guarantees traceably and organic security of each specific batch made. We have each batch of our matcha independently tested for heavy metals and pesticides by Eurofins laboratories , the world leader in food, pharma and environmental laboratory testing and the market leader in agroscience, genomics and product testing services with facilities all over the world. Unfortunately, sometimes simply choosing an organic matcha these days is not enough. Many farms are exposed to industrial pollution because of their geographic location. Although we source from a high altitude pristine location we still check every batch. Many matcha companies (specifically instant matcha blends) add corn starch or other fibres to make their matcha non- clumping. There are no non-organic ingredients in Matcha Ninja. It just 100% pure matcha. A concern that developed from us and our consumers, was the possibility of radiation contamination of Japanese tea leaves due to the Fukishima disaster . The tea plant, called the camilia sinsnus , is like a sponge and heavily absorbs whatever is in it's environment. This, coupled with the fact that with matcha you are consuming the tea by actually ingesting the whole leaf.